It is issued from The Anaheim First National Bank. This is an IMPOSSIBLE to find Orange County town! This note still has a good amount of crisp left to it and is in great shape with zero issues! It is a great bill! This bill is a must have for any collector of National Currency! All my items are exactly as described. Thanks for looking and good luck! 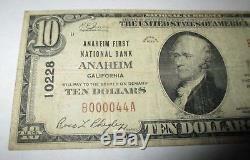 The item "$10 1929 Anaheim California CA National Currency Bank Note Bill Ch. #10228 Fine" is in sale since Tuesday, June 5, 2018. This item is in the category "Coins & Paper Money\Paper Money\ US\National Banknotes". The seller is "stoneyt66" and is located in Middletown, New Jersey.